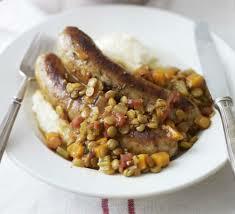 Fry the sausages in 1 tbsp oil in a casserole dish until brown. Remove. Tip in the carrots, celery and onion and cook for 10 mins, adding the chopped rosemary and half the garlic for the final min. Add the lentils, tomatoes and stock. Return the sausages, bring to the boil, cover and simmer for 20 mins. Remove the lid and cook for a further 10-15 mins until lentils are soft. Season. Sieve the hot milk over the rest of the potatoes and mash with the remaining oil, then season. Serve with the stew.